Achieve a natural-looking, sun-kissed glow with the Fabulous Self Tanning Gradual Lotion from Vita Liberata. Ideal for all skin tones, its lightweight formula acts as a daily body moisturiser, whilst delivering subtle colour that slowly intensifies without transferring onto clothing. 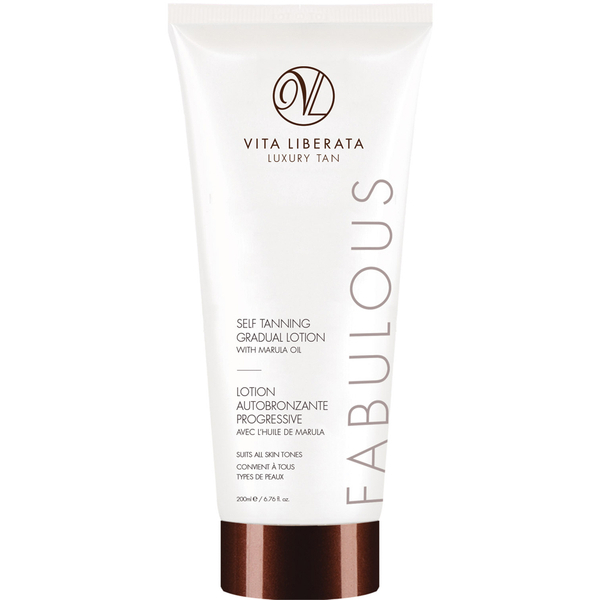 Containing Odour Remove™ technology to eliminate the unpleasant fake tan smell, the fast-drying lotion is infused with certified organic botanicals and a Moisture Locking System for a tan that fades evenly. Perfect for dry, mature and sensitive skin types, you can experience deeply conditioned, hydrated skin with a radiant finish. Apply to cleansed, exfoliated skin using a tan mitt in circular movements. Do not moisturise or use shower gel prior to application. Allow at least 4-8 hours before showering. Aloe Barbadensis (Aloe Vera) Leaf Water*, Dihydroxyacetone***, Glycerin*, Cetearyl Alcohol, Cetyl Alcohol, Glyceryl Stearate, Panthenol, Disodium EDTA, Butyrospermum Parkii (Shea) Butter (Beurre)*, Saccharide Isomerate**, Tocopheryl Acetate, Cucumis Melo (Melon) Fruit Extract*, Benzyl Alcohol***, Salicylic Acid***, Sorbic Acid***, Hyaluronic Acid, Vitis Vinifera (Grape) Seed Extract**, Ginkgo Biloba Leaf Extract*, Fucus Vesicolosus (Bladderwrack) Extract**, Sclerocarya Birrea (Marula) Oil**, Litchi Chinensis (Lychee) Fruit Extract*, Rubus Idaeus (Raspberry) Seed Extract*, Hydrolysed Silk (Soie), Glycyrrhiza Glabra.